The Token Valuation Canvas should help investors making the right decision when analyzing potential project investments. We have evaluated the Augur project using the BlockchainHub Token Valuation Canvas. Please note that classifications, categories and descriptions used in this canvas only represent a proposal of how a token could be evaluated. Augur is an open-source, decentralized, peer-to-peer prediction market platform built on Ethereum. Augur’s REP token is issued on the application layer through a smart contract on the Ethereum Blockchain. Augur is a decentralized prediction market platform that rewards its users for correctly predicting future events. Augur’s reputation token (REP) is a work token and gives the right to individuals to report or weigh in on the outcome of events. It can be earned by people who provide truthful reports. Total supply: The Total Supply consists of 11,000,000 REP.
Current supply: Current Supply = Total Supply = 11,000,000 REP.
Inflation rate: There are 11,000,000 REP in total, this number will not change and there is going to be no inflation. Categorised as a security? The SEC has released a press release on the 25th July, 2017 concluding that DAO tokens were in fact securities and that other tokens could be too. Here is a short abstract of this press release: “The SEC’s Office of Investor Education and Advocacy today issued an investor bulletin educating investors about ICOs. As discussed in the report, virtual coins or tokens may be securities and subject to the federal securities laws. The federal securities laws provide disclosure requirements and other important protections of which investors should be aware. In addition, the bulletin reminds investors of red flags of investment fraud, and that new technologies may be used to perpetrate investment schemes that may not comply with the federal securities laws.” Therefore, some ERC20 tokens (like Augur) could be rated as securities but the SEC has not issued a statement about Augur in particular so far. You can use the Howey test to decide for yourself if a token is a security or not. Where is the company registered? The Forecast foundation (The foundation behind Augur) seems to be registered in Estonia. Both co-founders are living in San Francisco, California, USA. On Crunchbase, Augur’s displayed location is also San Francisco. Legally approved? If we assume that the local government is the USA, then we have to be careful if the token could be categorized as a security. In tandem with the DAO report, the SEC published an investor bulletin about initial coin offerings, or ICOs. Among the items included was a warning about the risks of fraud for those who opt to participate. “Investing in an ICO may limit your recovery in the event of fraud or theft. While you may have rights under the federal securities laws, your ability to recover may be significantly limited,” the bulletin read. Nevertheless, at the time of the Augur ICO (17th August – 1st October, 2015), there were no official statements from the SEC concerning ICOs in general. How many? Augur has actually 37 repositories on GitHub and 7 of them are popular. The main repositories get updated regularly (every few minutes/hours). One of the main repositories has more than 10,000 commits. How often? There are code commits on a regular basis, every few minutes/hours the main repositories are updated. Are they simulating commits? Commits seem to be legit and not only typo fixes. Is it forked from another project? There is no information that Augur was forked from another project. Track record: Before creating Augur, Joey and Jack completed Sidecoin, which allows new cryptocurrency distributions based on “snapshots” of Bitcoin account balances. Long-term commitment? The team seems to go for long-term commitment, they post regular news on development updates on their Medium blog but they are probably not as active in marketing terms compared to other blockchain projects. For example, the last video on their YouTube channel was uploaded more than one year ago. Since when are they active in the community? Joey Krug started working on some prerequisite projects for Augur in 2014. He does not seem to have had any experience in the crypto scene before that. Jack Peterson first got in touch with Bitcoin in late 2010. After some time, he embarked on his first real cryptocurrency project: designing and building a distributed currency exchange for a site called Peercover, an entry point for the Ripple network. Peercover shut down a few months later, after falling victim to ACH fraud. He then worked on a few small cryptocurrency web apps after that, meeting Scott Leonard along the way. In September, 2014 Scott and Jack found inspiration in an academic project called Truthcoin, and joined forces with some other people to create Augur, the first decentralized prediction market platform. Jack then focused all his energy on developing Augur’s distributed event resolution algorithm, which is a heavily modified version of the Truthcoin mechanism. How many transactions? There are transactions every few minutes, users do transfer REP tokens on a regular basis but there are definitely other coins/tokens that have a much more intense transaction frequency. Stable running? Since Augur is running on the Ethereum blockchain, there does not seem to be any major issue concerning the stability of the blockchain at the moment. Potential uptrend regarding network usage? Personal opinion: The idea of a decentralized prediction market is nice, but, of course, the question always remains the same: Do people buy the token to use it (in this case by reporting event outcomes) or because of the cryptocurrency hype at the moment? So is a potential uptrend in token transfers happening because of some major quality development or because of a hype-pump? The answer to this question can be different for every token and should be analyzed together with a current development situation. In the case of Augur, when looking at their social media channels, it seems that there is not going to be any big major upcoming update for the moment that could predict a big uptrend regarding the token usage in the near future. The most hair-raising finding in Zeppelin’s audit report is a previously-unknown buffer overflow vulnerability in the Serpent compiler. This, combined with Serpent’s un-enforced types and a bug in Serpent’s computation of memory addresses, caused a non-loss-of-funds vulnerability in the REP token contract. The vulnerability allows someone to increase the token creation timestamp, indefinitely disabling transfers of the token. Augur and Zeppelin Solutions have then been working around-the-clock on a strategy to migrate REP to a new, secure contract. The new REP contract is written in Solidity, and is derived from OpenZeppelin’s ERC20 token contracts, which have undergone extensive security audits. The old REP contract was frozen: REP transfers can no longer be carried out using the old contract. How engaging? Users are quite active, especially on Reddit, new discussions are opened every day. Although the team posts regular updates on their Twitter and Facebook page, it seems that they had no “Ask me anything” session with the team recently. Maybe the communication with the public should be improved by hosting some AMA sessions, this seems to be missing. Are the founders active? The Augur team is quite active posting new updates about the project on their Medium blog (Augur Weekly Development Update). They are participating in various blockchain meetings but maybe not that often compared to other projects, you can find a few pictures from some events on their Twitter. For example on 12th November, 2017, Joey Krug held a presentation about Augur at the University of California in Berkeley, USA. Any AMAs (Ask Me Anything)? The only AMA until now was in December, 2015. PR Style? Although the team seems legit and committed to the project, they could probably improve their personal communication with the public. A good point is that they are posting weekly development updates via social media but they should definitely host a new AMA session to attract new investors. If there are difficulties, how quickly does the project recover? The biggest issue Augur ever had was probably the migration from Serpent to Solidity. During a security audit by Zeppelin Solutions in May (2017), the company found several critical issues and listed them all in a final report, Serpent was defined as no longer safe to use. With nearly $2 million-worth of its token (REP) sitting in a contract written in Serpent, Augur had good reason to be concerned about the security of the older language. Augur and Zeppelin Solutions worked around-the-clock on a strategy to migrate REP to a new, secure contract. The new REP contract is written in Solidity, and is derived from OpenZeppelin’s ERC20 token contracts, which have undergone extensive security audits. The migration was successful and all major issues were solved, no funds were lost. After the migration, the old Serpent REP contract was frozen: REP transfers can no longer be carried out using the old contract. Trading Volume: The trading volume on exchanges is actually ~$15,000,000 (taken from coinmarketcap.com: 16th December, 2017 – 20:00). Augur is listed on more than 10 exchanges including the most popular ones, like for example Bittrex or Poloniex. Market uptrend: Currently, 1 REP token has a value of ~$44 (16th December, 2017 – 20:00) In my opinion, the current price seems to be overvalued at the moment if we consider that 1 REP token was worth ~$17 in early November (2017). There are actually no major upcoming events announced on their Twitter for the near future. The Solidity Compiler Audit Report from the 11th December, 2017 was the last interesting post, but probably had no big impact on the current price increase. The current price increase seems to be more due to the current hype situation. The funds raised were worth ~$5,000,000 at that time. For how long will it run? The ICO started on 17th August 2015 and ended 1st October 2015. At the time when the ICO finished, Augur was one of the top 20 most successful crowd-funds worldwide. Token pricing during ICO? Although there are slight differences on various websites concerning the exact raised ICO funds, the average token price / REP must have been: ~$0.60 / REP.
Any institutional investors? Purchases of REP in BTC were made from 2,440 accounts. The average (mean) purchase (per registered account) among them was 7.639293 BTC (or US$1854 at current prices) and the median purchase was 1 BTC (or $244 at current prices), which was also the most frequent transaction size (mode). The overwhelming majority of accounts (more than 60%) purchased less than 2 BTC each. Fourteen accounts purchased more than 1% of the BTC total. Purchases of REP in ETH were made from 304 accounts. The average (mean) purchase (per registered account) among them was 3782.545482 ETH (or US$2420 at current prices) and the median purchase was 202 ETH ($129 at current prices). The most frequent transaction size (mode) was 1000 ETH. The overwhelming majority of accounts (69%) purchased less than 1000 ETH each. Twenty one accounts committed more than 5000 ETH. Is it too generic? It is not too generic. It seems even a bit too technical for the average user. Does it explain the need for a token? A key feature of Augur is tradeable Reputation (REP). The total amount of Reputation is a fixed quantity, determined upon the launch of Augur. Holding Reputation entitles its owner to report on the outcomes of events, after the events occur. Reputation tokens are similar in other respects to Bitcoins: they are divisible to eight decimal places, they are accounted for by summing over unspent transaction outputs, and they can be sent between users. A significant way that Reputation differs from Bitcoin is that Reputation is not intended to be a stable source of value: Reputation tokens are gained and lost depending on how reliably their owner votes with the consensus. Reputation holders are obligated to cast a vote every time the network ‘checks in’ with reality (by default, every 8 weeks). Another significant difference is that Reputation is not mined. Instead, Reputation will be distributed by means of an auction. This solves two problems. First, it will provide funding to complete the development of the Augur network. Second, it bootstraps the network with an initial group of Reputation-holders who are invested in the network’s success. Created for marketing reasons only? It doesn’t seem that the Whitepaper was only written for marketing reasons because it is not really pretty. There are only basic black & white graphics and mostly text. Governance: An extract of Augur’s token economics: Reputation tokens are gained and lost depending on how reliably their owner votes with the consensus. Reputation holders are obligated to cast a vote every time the network ‘checks in’ with reality. Who wrote it? The Augur Whitepaper was written by both co-founders Dr. Jack Peterson & Joseph (Joey) Krug. In their last Weekly Development Update post on their blog from 13th December, 2017 they talked about the publishing of the Solidity Compiler audit report. They also stated that contract audits are in their final phases. Code quality? The analysis was made without the help of a developer but let’s have a look at Zeppelin Solutions’ blogpost about Augur’s REP Token Vulnerability. As already mentioned in this canvas before, Augur’s Serpent Compiler had several critical security issues and had to be migrated to Solidity. Zeppelin Solutions wrote a whole summary of their audit in their blogpost and stated the following: “It is important to note that the critical vulnerability was in the Serpent compiler’s code, not in Augur’s code.” This statement from after the security audit seems like a positive point to me concerning Augur’s code quality in general. External Audits? Augur has done a few audits so far. In their blogpost from 23rd May, 2017 they stated that they are starting with the auditing of Augur’s smart contracts in general. Then there was the Serpent Compiler Audit -> You can find the full report from Zeppelin Solutions in the “References” section. Their last audit was the Solidity Compiler Audit -> You can find the full report from Coinspect in the “References” section. Too ambitious? The team doesn’t look like they are too ambitious. They seem to deliver what they promise, maybe sometimes more slowly than planned, but they do it. It is a good idea that they regularly update the beta status topic on Reddit step by step, which gives a great overview of what they are actually working on. In their roadmap blogpost they also stated the following: “We want to launch slowly. In the beginning the core dev team will essentially have carte blanche to modify things, replace/upgrade contracts, etc in the case of a fault event or vulnerability after launch. The idea is to sort of start with “training wheels” and slowly remove them over time as the system proves to be secure. If something went wrong we could quickly update the contracts. If we maliciously updated them a fork of Augur would almost certainly develop, which is good! Early on the probability that the developers are malicious is lower than the probability of bugs and vulnerabilities. Later on we can switch to a decentralized way of updating things.” This seems to be a well-conceived and careful strategy and is definitely not too ambitious. On schedule? A comment from a user on Reddit indicates that the release was expected to be in the late summer of 2017, but due to some bugs and the problem with the Serpent Compiler it was pushed back. But in general, they seem to be on schedule, they just don’t want to hurry and maybe face security issues because of that. In their regularly updated Beta status topic on Reddit they wrote that there is no hard date set for Augur’s launch until now. 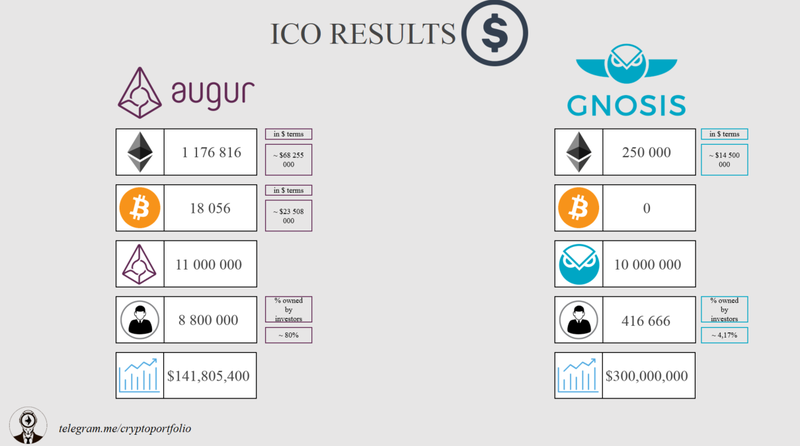 Competition: The most obvious competitor to Augur is, without question, Gnosis. Like Augur, Gnosis is an Ethereum-based platform for prediction markets. However, Augur has a higher market cap compared to Gnosis at the moment. While Augur and Gnosis compete to do similar things, they are on the same team when it comes to mass adoption. Both teams are more concerned with competition from well-established, centralized betting platforms such as Betfair, Bookmaker, and Nadex. You can find a link in the “References” section to a Medium blogpost from Gnosis describing the differences from their point of view. Demand for the product? Augur’s token price is rising together with a lot of other blockchain projects at the moment but in my opinion this is probably because of the current hype and not because of a “real” demand for the product, especially when it is not fully launched yet. But there will probably be some demand once the project gets launched because it has some kind of “gambling” aspect in it. Nowadays, people want to know everything and earn a lot of money, so they will probably like the idea of getting paid for trying to tell the truth. There are already centralized, non-blockchain alternatives like, for example, Betfair, Bookmaker or Nadex. Revenue streams for future development: As you can see in the ICO section of this canvas, Augur collected more than 18,000 BTC and over 1,000,000 ETH in 2015. There is no exact information about how many funds they already sold after the ICO but concerning the recent price increase of Bitcoin (~$19,000) and Ethereum (~$700) there should still be enough funds left for a successful future development. Widely known? Augur is quite well known, although compared to other bigger projects like Dash or NEM for example, Augur is not that popular, of course. Security: As already mentioned: Augur performed a security audit in May (2017). The vulnerability in the Serpent compiler was a big issue and had to be migrated to Solidity (Ethereum’s contract language). At the moment, no critical security issues concerning the contract language seem to have remained unsolved. Coindesk – A ‘Howey Test’ for Blockchain? Medium – Howard Marks – ICO Alert: ERC20 is a security. Why?